Gates open at 6:00 p.m., show at dusk. Stan State Theatre Under the Stars presents "The Threepenny Opera" by Bertolt Brecht and directed by Kitsy Olson. 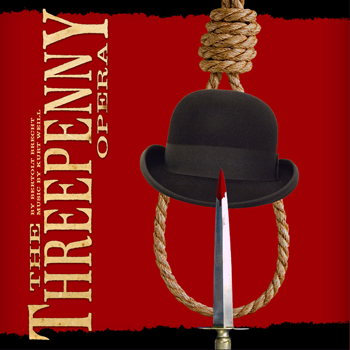 The Threepenny Opera is a biting satire of the post-war rise of capitalism, wrapped up in Kurt Weill's jazzy score, and the tale of Macheath (Mack the Knife), a debonair crime lord on the verge of turning his illegal empire into a legitimate business. Come and enjoy a beautiful evening on the lawn, under the stars, with The Threepenny Opera! Low back chairs and blankets and picnics welcome. Persons with disabilities who anticipate needing special accommodations or who have questions about physical access may email kevans1@csustan.edu or call at (209) 667-3451 in advance of the event.